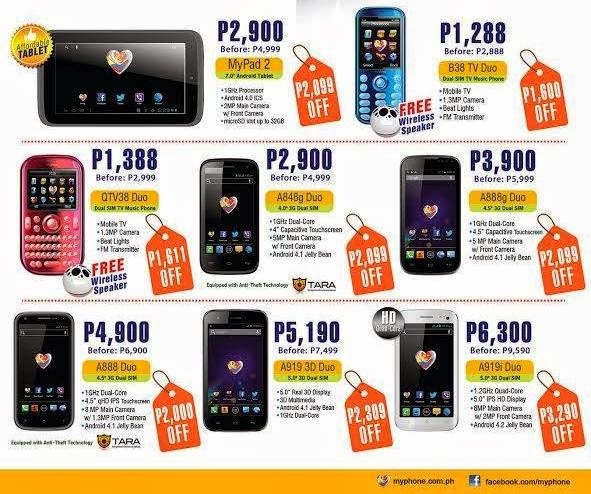 Hurry and visit your nearest MyPhone store and kiosk to avail any of the phone and tablet listed on their Gadget Sale. If you're planning to get a new phone do check out the promo price list and choice your ideal phone that fits your budget. You can also visit their online store in case you do not have time on dropping by to any of their stall and resellers. Browse their latest gadget available from Agua phones, Fuego, Viento to Tierra tablet then order by checking out on your shopping cart. Do note that this promo price may change without notice, you can visit MyPhone Facebook page for updates. In case you’re still undecided on what phone or tablet to buy for yourself you can check also Cherry Mobile Price List for comparison purpose. You can choose from MyPhone’s wide variety of products on sale, select from budget range below 2000, 3000, 4000 up to 6000 pesos phone or you can go for their 2000 plus off tablet. In case those models listed above is not available on your area, you can check out and inquire through their online store.